I found myself reflecting on cars. I live in LA and cars are oh so very "important". The quotation marks are there because for some people, cars still are very important in a practical sense as a means to get around, even with more trains being built and electric scooters springing up on every corner. But mainly cars are "important" to show other people how much money or coolness you have - or both. Twice last year I was inside a fancy new vehicle belonging to colleagues and I found myself so glad that I'm not that person anymore. I used to dream of being that person, of having the brand new fancy, fast, sleek car. And then I got over it. I've been lucky with cars. I learned to drive and got my license at 15 in a hand-me-down Honda Civic (stickshift) (the image at left is similar to the one I had but mine was blue). I had been in a carpool up until then and now it was my turn to be the driver of the carpool. The car was small, 2 doors and a hatchback, but you could jam 5 people into it for trips to the beach or camping. I said good bye to it in college and didn't have a car in LA until sophomore year when I got a hand-me-down 1969 VW bug (stickshift of course). The car came with about 3 different colors and a few dents here and there. I saved up $100 and got a cherry red Earl Sheib paint job. It looked like this one except it had a black interior. It was startling how much camera and film gear you could get in that thing. Or roommates to go to crew practice at zero dark thirty. Or how easy it was to jump start it when need be. I could jump it on my own, no help from extra hands -- one foot out the door to push it along, to build momentum, then a quick pop of the clutch and off you go. I will always have a special place in my heart for bugs. That special engine sound, the smell, the wacky pedals. After getting a license, there were cars to dream about. I dreamt about sports cars, I liked speed. Magnum's Ferrari and then later the Acura NSX. Had to love the NSX because it was a proper sports car but it was still a Honda. Of course there were more practical dream cars and one of my dreams came true. A few years after college, while still driving the bug, I bought a brand new Honda CRX! It was also read, also stickshift and came through the kindness of a partial loan from my grandmother. I kissed the bug good-bye (it went to a younger family member for more service) and proudly drove my dream car. I got the base model, the HF (stickshift). Oh it was spiffy with 105 horsepower, manual crank windows and no air conditioning! And I loved it. I looooooooved it. I drove it for about 8 years. It got into one crash (an insurance scam crash that I was a victim in, luckily no damage to me and easily fixed damaged to the car) and it got stolen once for the seats. Thankfully I had good insurance for both of these instances. But I was ready for a grown up car to go with my grown up job. My new dream car would have 4 doors and a trunk. I wanted 4 doors sooooooo badly. And a trunk that no one could see into. 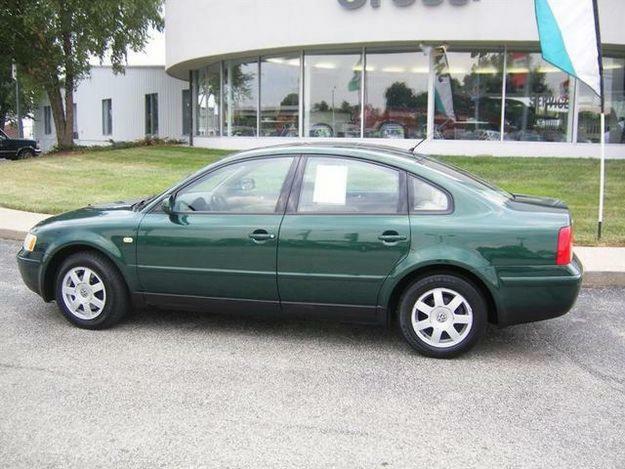 I considered some higher end cars but decided to keep payments low and went for a green VW Passat. (stickshift) Fun and new but not anything to break the bank. I said good bye to the Honda, thanking it for all its dream car services in my 20s. The Passat lasted less than 2 years simply because my dreams started changing. I wanted to be freelance, not tied to a company where I didn't have much say in the jobs I worked on or the teams I was assigned to. I got laid off (which I helped engineer) and smartly sold the Passat right away. I didn't have another car to buy so I drove a Rent-A-Wreck for a month or so. It was a POS Nissan something something, but it was clean, cheap and got me where I needed to go. Now we have that 10 year old VW GTI (stickshift) and a 3 year old Subaru outback (AUTOMATIC!!! First automatic I've ever owned). There was Kurt's Honda Accord (also stolen once) and his mom's 2001 Buick Park Avenue mixed into the last 15 years. People still ask me what my dream car is. And I haven't had an answer for that since 1990 with the Honda CRX. These days its more like "does the bluetooth work, are there 4 doors and is there a back-up camera? I'll take it". A rental car that takes me and the family on new adventures. 2 years ago it was a white Citroen in Lucca, Italy. 1 year ago it was a blue Vauxhall that took us to magical places in England. Those were dream cars. Now I can't wait to see where the next dream car takes us. In LA there is a weather pattern called June Gloom for the West LA/Santa Monica side of town. It's cloudy and cool in the mornings then it get sunny toward the afternoon. But I'm referring to my June gloom. Starting the month with a cold. But not just a cold, a cold with a fever, something that rarely happens. It blows. Harper was sick, is still sick, though better and I know I got it from her. Kurt is coughing a bit too. Frankly, we are all a bit pathetic and gloomy. Then we heard yesterday that Kurt's stepmother died. I never even met her, but am so sad she is gone. Ever since Kurt and I got married, she never failed to send birthday cards and holiday cards and even anniversary cards. There was always a check in the card and a sweet note about how she was doing. We always wrote back and of course lately sent her many pictures of Harper. I always thought I'd meet her someday and thank her in person, but never got the chance. I don't even know what she looked like, which is kinda nutty after 14 years. Just another reason to remember that life is short and not to put things off any longer. I'm going to miss getting her notes in the mail. On a happier note, here's Harper driving the toy tractor at our favorite weekend place, the Underwood Family Farm. She had never driven before, but dang, she really was amazing, never bumped into anyone and steered perfectly. Dorothy Frey loved to drive. I'm not sure where her love for driving started, perhaps in her childhood as her dad had one of the first cars in Houston and they often took road trips. She and her sister, Millie, I think, took a road trip when they were young women and she often told the story of how their car got stuck and they got rescued by some cowboys, actual cowboys on horses, then went to a dance with them later. This would be in the 1930's. After she retired in the mid 1980's, she got a job with Hertz shuttling cars around the southwest. Mostly just for fun. Apparently she once owned a Buick Wildcat with Pursuit engine! Something like this, I think. When Kurt and I got married, Dot was 83. She drove to LA for the event from Dallas/Ft. Worth. By herself. For fun! Her former husband, Kurt's dad, used to race cars for fun (amateur events). They had races for the wives and Dot won every time she raced. When we moved her out to LA, her car came with her: A 2001 Buick Park Avenue, light blue. She didn't drive anymore, really it was getting time for her to stop at 90 years old, so the timing worked out. But we kept her car so that every time we drove her places, she could ride in her car. Personally, I really don't love this car. It's big, it's floaty, its an automatic, it's big. It's an old lady's car and while I'm no spring chicken, I'm NOT an old lady! I'll admit I live in LA and am sensitive about my car image. But since Dot died, I have been thinking about her and her cars. I thought about the "last times" - the last times she rode in the Buick which was to the doctor's office in January where she was admitted to the hospital. (She came back to her apartment from the hospital in an ambulance.) Of course we didn't realize it would be the last time, at the time. And the last time she actually drove the car. That would have been in 2008 when she and Kurt (and her two cats) drove from her home in Texas to her new place here. I doubt there was specific talk about "you'll never drive a car again" when we moved her, but she knew she couldn't drive in LA. So on that road trip out to LA, Kurt let her drive for a while on the big wide freeway. It makes me happy/sad to think about that last bit of driving she had. Dot wasn't particularly sentimental or expressive with her feelings (she was old school all the way), but I often wonder what she might have been thinking or feeling while driving that dessert highway in a car she loved so much. I hope she was happy. Harper rollin' home from preschool, yo. Harper crawled around the inside of the car today and discovered the driver's seat. Major slow down on Willoughby this morning. I love LA. You have arrived in the UK and are handed a car key and a rental car. I will now describe the four phases of driving on the wrong left side of the road so you can be prepared when this happens to you. Keep in mind that the will be a stickshift so if you need automatic, make sure you let them know ahead of time. Most importantly, don't panic. Just take it slow and take your time. UK drivers are really really friendly and generally pretty patient. Phase 1 -- Utter panic. Say the phrase STAY LEFT! out loud as often as you need to. This lasts about two days. Phase 2 -- More at ease. Your right hand will be bruised as you bash it into the door looking for the gearshift. The mirror positions will feel all wrong and it will be hard to know where to look for surrounding traffic. You'll laugh everytime you reach with your right hand for the seatbelt that doesn't exist over your left shoulder. You will walk to the wrong side of the car to get in. This phase lasts 3-5 days. Phase 3 -- Ease and comfort. You've been driving for a few weeks now, every day. It seems perfectly normal. However, this is the most dangerous time. Because you feel at ease, you are not thinking about driving anymore and your old instincts kick in. At an empty roundabout you will feel the urge to go right instead of left. You may forget to look to the left for cross traffic, etc. During this phase it doesn't hurt to pull out a few "Stay left! "s from time to time. This step can last for weeks. Phase 4 -- Native driver. Effortless, nothing bothers you and you remember to fold your side mirrors in when you park. This takes months/years. I am currently in Phase 3 and don't have much more time to get to the native level. I have enjoyed the challenge. Turned out to be much easier than expected. The only thing I can really complain about is the street signage and street names. Hard to see street signs, if they exist at all. And streets tend to change names A LOT. Within one mile a street name can change two or three times. Not saying it's bad, just different. While I share a car with my colleague, he's never driven and that is fine with the control freak inside of me. I am a spectacular driver and navigator and got us to set in the pitch dark every morning, only having to check directions once or twice. We drove a crew member home the other night from set and she was really impressed that I knew where I was going when she told me where her car was parked (near the production office). I was impressed with myself too.